Who would have believed that this groundbreaking educational initiative, which launched in 2015, is already bestowing BA degrees unto five graduates. Two of which have already been accepted into continued studies at Abraham Geiger College for a combined MA and rabbinic training program. Over the course of its three years, 17 students have undertaken studies in Modern Judaism at the Institute for Modern Jewish Studies in Moscow. Applications for the upcoming year are underway and growing in numbers. 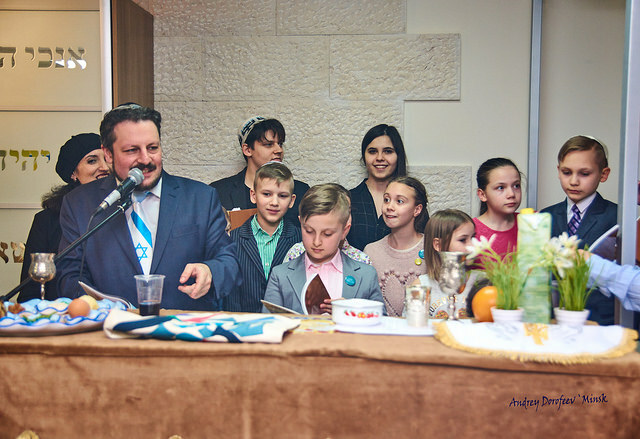 To meet the students, teachers, founders and leaders of this transformative program, click through to hear, first-hand, how we’re growing and strengthening Reform Judaism for Russian-speakers across the region. The Institute for Modern Jewish Studies, a partnership of the WUPJ, Abraham Geiger College, Russian State University of the Humanities (RSUH), and Pottsdam University, to train Russian-speaking rabbis for the region, offers a four-year BA degree program at RSUH Institute in Philology and Jewish Theology called “Art and Humanities with a specialization in Jewish Theology”. Students recognized as having potential to continue toward rabbinic studies are jointly guided by the Institute for Modern Jewish Studies and the Abraham Geiger College, after their successful application at both Institutions. To learn more about the Institute for Modern Jewish Studies and the World Union’s efforts to grow Reform Judaism in the FSU and strengthen Russian-speaking congregations in the region, click here. Please fill out this form to share "The Institute for Modern Jewish Studies in Moscow" via e-mail.